Through the late 80s and 90s there were three primary Spider-Man monthly titles. 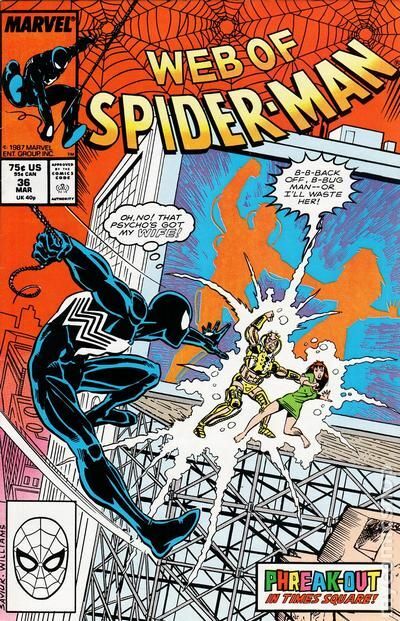 There was the main flagship comic the Amazing Spider-Man and two other titles. The 2nd major title was Spectacular Spider-Man which had a focus on some of the secondary characters in Spider-Man's life. Then there was Web of Spider-Man, which had the unfortunate position of having to focus on the third tier characters. While it may seem weird as a kid, I always liked Web of Spider-Man the best of the three. Yes it was the red headed step child of the three but I always like the focus on some characters who had never had a chance to really be fleshed out. One of the characters who was given a time to shine was Joe Robertson. Joe "Robbie" Robertson is one of the oldest black characters in all of comics but he did not always get much time to shine but that began to change with Web of Spider-Man #36. Our copy of this is pretty good. There is some ever so slight creasing on the binding that I would say holds it back from a NM book. 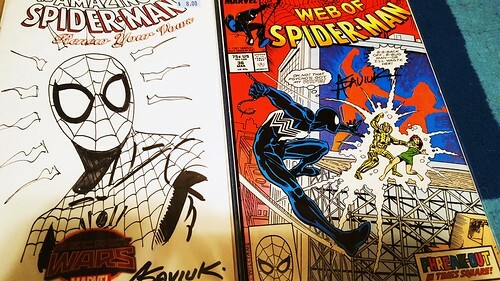 It was signed at Denver Comic Con 2016 by Web of Spider-Man artist Alex Saviuk. Alex also did a Spider-Man sketch for us on The Amazing Spider-Man: Renew Your Vows white cover. The story begins with Spider-Man swinging toward home and where he picks up MJ. He complains about how hard his day has been (Most Spidey days are like this though) and she explains how her hunt for an apartment is going. Meanwhile the issues main villain Phreak is created by kids in a school basement. One of the kids is experimenting with a new exoskeleton thingy and when the power is accidentally turned on he gains electrical abilities. A mysterious man is being followed by sinister looking pale man,...TOMBSTONE. Robbie Robbertson sees Tombstone and looks upon him horrified. Tombstone is thus introduced immediately as having a person connection with Robbie Robertson. This connection is not expanded on here. In true comic form we have to wait to see more of Tomb Stone and the connections he has to Robbie. Another scene shows the new Tarantula undergoing treatments to gain powers. The rest of the comic involves Phreak kidnapping MJ (Man it stinks to be Spider-Man's girl friend) but good news the webslinger is hot on his tail. Spider-Man ends up punching him into an electronic sign where he shorts out. One of his friends to school promises to take care of him and hauls him away.